Despite significant progress in recent decades, American women remain disadvantaged in terms of pay, promotion prospects and work-life balance. Other areas of concern include educational attainment and labor force participation, legal maternity rights and family-friendly workplaces, and presence of women in positions of power. According to a 2012 Census Bureau report, women make as little as 77 cents for every dollar that men earn for equivalent work. This and similar figures are often cited, but there’s a lot of nuance in the particulars, including the type of work performed and workers’ age, race and ethnicity. The gender pay gap is much smaller for younger individuals. Among 25- to 34-year-olds, the women’s-to-men’s earnings ratio was 90% in 2012, compared to 75% for 45- to 54-year-olds. Education is a key determinant of pay for both women and men. Those without a high school diploma earned on average 40% of those with a bachelor’s degree or higher in 2012, and those with a high school diploma but no college education earned 50% of those with a degree. This result holds for both genders. The occupational distribution of men and women is very different. While women are more likely than men to work in professional occupations, the proportion of women employed in the higher-paying job groups, such as engineering and computing, is smaller than the proportion of men employed in them. At all levels of education, women’s earnings growth has been better than men’s over recent decades. 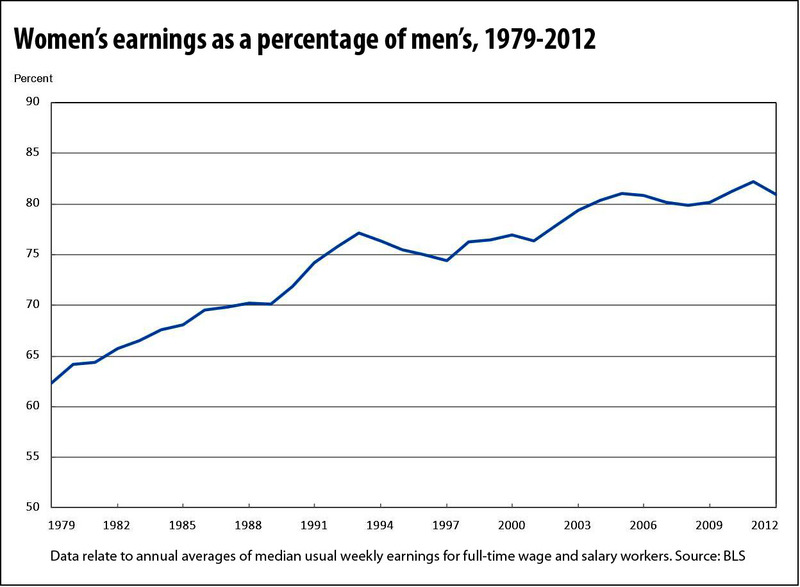 For example, the real earnings of women with a college degree have risen by 28% compared to 17% for men. Even when average wages have fallen, those for women have fallen less: The inflation-adjusted earnings of women without a high school diploma have fallen 14% since 1979, for example, while those of men dropped 32%. Among full-time workers, men are likely to work more hours per week than women. Even controlling for the longer workweek, the pay gap remains: Among full-time workers with a 40-hour workweek, women earned only 88% as much as men on average. Women are more likely than men to work part time (less than 35 hours per week): 26% of all female wage and salary workers were part time in 2012, compared to 13% of male workers. Although women and men who worked part time had similar median earnings, men who work part time are on average younger than women who do so: 43% of male part-time workers were 16 to 24 years old compared to 29% of female part-time workers. The report demonstrates that the gender pay gap still consistently pervades every segment of society — by age, race, education level, occupation type and hours worked. A related 2013 report from the Bureau of Labor Statistics, “The American Time Use Survey,” provides insight into the challenges that women face in balancing work, family life and household chores. Among its findings: On an average day, 82% of women spent some time doing household activities, compared to only 65% of men. Furthermore, a 2013 study from the University of Alabama, “When You Just Cannot Get Away,” found that women were more likely to have negative work-home spillover, and respondents in the two lowest family income brackets had higher negative spillover than those earning more. Citation: Bureau of Labor Statistics, "Highlights of Women’s Earnings in 2012," October 2013, report 1045.